A union of palm oil smallholders is challenging the allocation of a billion-dollar fund that they say fails to help them rejuvenate their low-yielding oil palms and instead unfairly subsidizes large biofuel producers. Only 1 percent of the fund went to the smallholder replanting program last year, while 89 percent went to the biodiesel subsidy. The government has promised to amend the split to 22:70 this year. But the government has also defended the subsidy, saying it needs to artificially boost the price of crude palm oil, to make biodiesel competitive with the regular diesel sold in the country — which is also subsidized by the state. JAKARTA — Oil palm farmers in Indonesia are mounting a legal challenge to get a bigger share of a government fund they complain is being misused to subsidize biofuel producers. The Indonesian Oil Palm Plantation Fund, or BPDP-KS, was set up in 2015 to manage an export levy imposed on exports of crude palm oil and processed palm oil products. But representatives of the main union of oil palm farmers in Indonesia, the SPKS, say the government has failed in carrying out the last part of that obligation, and are now challenging the constitutionality of the fund allocation in court. “The fund allocation right now looks very unjust and harms farmers,” Marselinus Andry, head of the union’s advocacy department, told reporters in Jakarta. Rather than being used to help small farmers replace their aging palm trees with higher-yielding variants, he pointed out, the collected levies are largely used to subsidize major producers of biofuels that use palm oil. Only 1 percent of last year’s fund went to small farmers in the form of funding for a state-run replanting program. By contrast, 89 percent of the funds collected by the BPDP-KS were channeled to 19 large companies as biodiesel subsidies. The rest of the money was used for human resources development, research, and promotion. 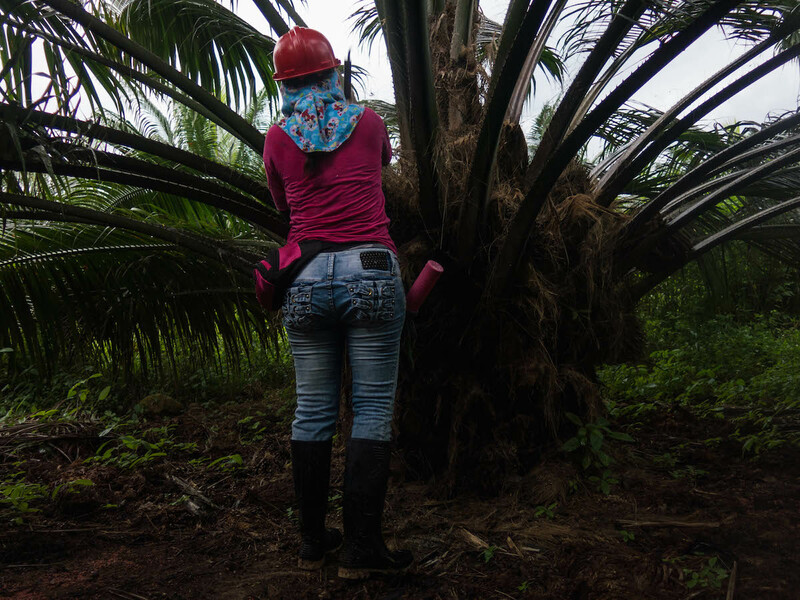 A plantation worker applies herbicide to an oil palm tree. 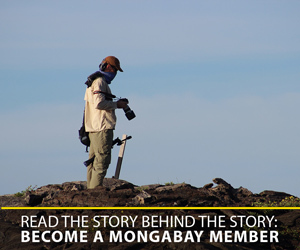 Photo by Bram Ebus for Mongabay. Both independent and plasma farmers manage smallholdings, but plasma farmers have agreements in place with larger companies that cover support and logistics, and which guarantee that the companies will buy their palm fruit. Independent smallholders, by contrast, typically learn how to manage plantations with no training, no supervision, and limited support from the government. As a result, they face many challenges, such as low yields due to poor-quality seeds and outdated farming techniques. The average smallholder yield is only 2 to 3 tons of palm fruit per hectare, compared to the 20 tons per hectare that large plantation operators can achieve. And when their oil palm trees have aged, small farmers find it difficult to replace them because of the time and cost. It can take four years for new trees to be productive. Throughout this period, when the farmers often have no other source of income, they still need to invest in new seedlings and fertilizers, and protect the young trees from pests and disease. With land for planting oil palms in Indonesia growing increasingly scarce, the government doesn’t want small farmers to try to boost productivity by expanding their planted area. Instead, it prefers that they increase their yields through the use of better-quality seeds, standards-compliant fertilizers, and best farming techniques. To that end, the government last year launched a replanting program in which it helps farmers replace their aging oil palms by giving them free seedlings. It also helps them obtain land title certificates, and gives out free corn seeds for intercropping, so that the farmers have an alternative source of income during the period when their oil palms are not yet productive. All this is meant to be funded from the BPDP-KS. The ultimate goal is to boost farmers’ flagging yields by squeezing more output from existing plantations. 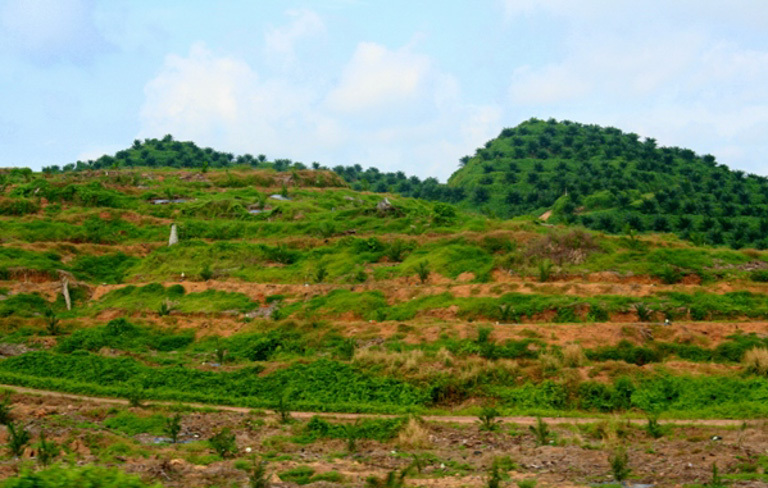 An estimated 24,000 square kilometers (9,270 square miles) of plantations in Indonesia are in need of replanting, a sixth of which are already considered “old.” The government program aims to replant 1,850 square kilometers (714 square miles) of smallholder plantations this year, after targeting 200 square kilometers (77 square miles) last year. The government argues that it needs to subsidize biofuel producers to allow their product to compete with regular diesel, which is subsidized by the state. This, it says, will boost domestic demand for palm oil, preventing an oversupply of the commodity and stabilizing the price of palm oil on the global market. He said smallholders also had to jump through hoops simply to access the oil palm fund, citing the various “legal requirements needed for small farmers” to participate in the replanting program. “We all know that legality is a challenge for farmers, especially those in forest areas,” Marselinus said. Some 17,000 square kilometers (6,560 square miles) of smallholder plantations are located inside forest areas, and thus are technically illegal under prevailing regulations, which only permit plantations in non-forest areas. Some farmers are also reluctant to apply for the replanting fund because of how little they stand to receive. Bernadus Mochtar, a farmer from Sekadau in West Kalimantan province, said he knew of a farmer who received a total of 10,000 rupiah, or only about 73 cents, from the program. “It’s better for us to replant using our own money,” he said during the press conference. Oil palm in Borneo. Photo by Rhett A. Butler/Mongabay. Under pressure from small farmers, the BPDP-KS management has vowed to increase its funding allocation for the replanting program to 22 percent of the fund this year, up from 1 percent the previous year. At the same time, it will cut the biofuel subsidy allocation to 70 percent, from 89 percent previously, according to Edi Wibowo, the director of fund dispensation at the BPDP-KS. But the farmers’ union is still pushing ahead with its legal challenge, arguing that none of the money should go to the biofuel subsidy program in the first place. Rida Mulyana, the director-general of renewable energy at the Ministry of Energy and Mineral Resources, which regulates the country’s biofuel industry, justified the channeling of funds to biofuel producers, saying the money did not come from the state budget. Indonesia’s anti-corruption agency, the KPK, has also taken notice of the uneven fund disbursement. Sulistyanto, deputy for prevention at the KPK, told reporters last month that the agency was looking for ways to make sure farmers got a bigger piece of the pie. Edi, of the BPDP-KS, said that if the farmers’ legal challenge prevailed and the court ruled to end the biofuel subsidy, it would ultimately hurt the farmers themselves. He said the subsidy had increased demand for palm oil, in turn boosting the price of the commodity, which benefited small farmers as much as it did large producers. BPDP-KS senior adviser Rudi Gobel said the only feasible option to keep the price of Indonesian palm oil high was through the biofuel subsidy. 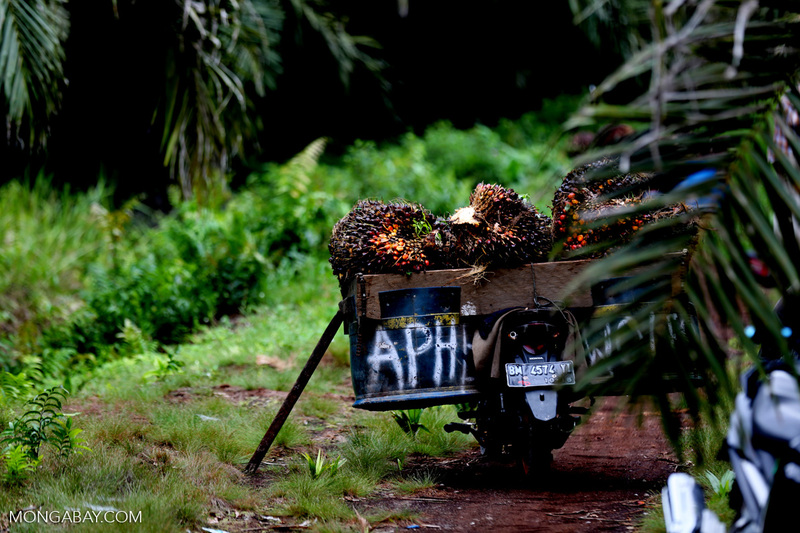 Banner image: A worker on an oil palm plantation on Indonesia’s main western island of Sumatra. Photo by Rhett A. Butler/Mongabay.